Last weekend, Child Two and I went to SuperSunday at the Vancouver Art Gallery. If you live in the Lower Mainland and know children who like doing art, I highly recommend this. It’s a monthly free event for kids (adults pay admission to the gallery), with a wide variety of art activities related to the current exhibits. We don’t go every month but, depending on our schedule and on whether the exhibits have changed since we were last there, we go as often as we can. The first time, we tried to view the exhibits and get in all the activities that Child Two wanted to do and I sat and waited for her while she worked. Based on that experience, (a) if there’s an exhibit we really want to see, we go on a different day because there is just too much to do on SuperSunday and (b) I started bringing some knitting to do while waiting. On one of our visits, Child Two taught me some very important lessons about art and, really, about life in general. One of the exhibits included a huge sculpture of an elephant. We waited in line for over half an hour so that Child Two could build an animal sculpture herself. The twist to this activity was that she didn’t choose her own materials; they were decided by her spinning a spinner. She got the following to work with: a paper bag, four cone-shaped paper cups, a smallish block of wood, a piece of cardboard, and two small plastic cylinders of different sizes. The room was hot, crowded, and very noisy—the kind of atmosphere that makes those who’ve chosen not to have kids very happy with their decision. It was getting late in the day and many of the younger kids there had obviously missed there naps. We found a spot at a table and I watched as Child Two tried various arrangements of her materials. We looked at other people’s projects for ideas and tried some more, but no animal was forthcoming. I started to feel the way I used to feel when I couldn’t do something I had to do, like climb a rope in PE class or answer a seemingly impossible question on an exam. I got tense and panicky and—I hate to say—felt like I might start crying. “This is impossible. How can anyone build an animal out of this stuff?” I thought, starting to get angry. I was about to suggest giving up when I realized that Child Two was not at all tense. She was enjoying arranging and rearranging her materials and laughing at the results. She wasn’t worried about making something “good” or “right.” This was just a fun activity at the art gallery, after all, not the bar exam. I shut my mouth and pulled out my knitting. She rearranged and I knitted and we chatted until she built something that vaguely resembled an animal. Once it was immortalized with hot glue, she decorated it and, lo and behold, it became a recognizable dog. She taught me more than one lesson that day: patience, perseverance, creating something just for the joy of it, not caring about being perfect or the best. Most importantly, though, I gained a new sense of perspective. Not everything is black or white, right or wrong, good or bad. This wasn’t a test to be aced or a life-or-death situation that had to be negotiated successfully. No, it was just a fun activity to be enjoyed for what it was. Last Sunday was our first SuperSunday of my Year of Living Differently, and, although I did bring my knitting, I decided to do most of the activities myself (the gallery wholeheartedly encourages the adults to do this). I sketched, I painted, I made a collage out weird things, I blow-painted with ink and a straw (how fun is that?). As I’ve implied in an earlier post, I am challenged by anything more complicated than stick people, but Child Two has taught me that at these events, it’s not about the product—it’s all about the process. I’m currently finishing a hat, but it’s in the fiddly, double-pointed-needle, decreasing stage and we all know what happens when I attempt that while distracted. So before we left the house I grabbed a ball of yarn and some needles. I usually use circular needles for everything—having been a crocheter first, I find long straight needles get stuck in my elbows and jab me in the armpit—but since I’m living differently, I chose short straight ones; the size was determined not by gauge but by the fact that these are the only short ones I have. 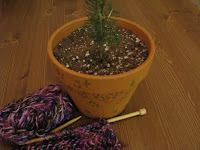 I cast on a scarf while Child Two was doing decorating a pot and planting a tree. The pattern was developed on the fly (also a different way of working for me )—we’ll see how it turns out. 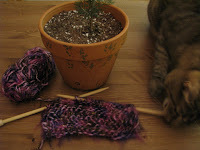 Oh, and apparently Little Bit would like to take up knitting, despite her lack of opposable thumbs.